← Blu-ray Giveaway: “Get Out”! Read the original piece RIGHT HERE at The Green Man Review! I’m a sucker for a utopia-but-not-really story. From The Dark Secret of Harvest Home to Red Rising, there’s just something about a tale that digs into the dark underbelly of what was once a beautiful set of ideals. With echoes of We Have Always Lived in the Castle, Atonement, and a touch of M. Night Shyamalan’s The Village, Wasserberg’s debut novel takes a look at a Utopian communal “family”, and lets us see what happens when things unravel. And unravel they do. From the first page, where our young narrator Green takes us by the hand and leads us into the halls of Foxlowe, we sense that all isn’t daisy chains and kumbaya. Wasserberg’s beautifully descriptive prose lulls readers into a false sense of security, one she yanks out from under them with ease. Her way with gently slipping in descriptions of abuse, mistreatment and not-so-benign neglect creep into Green’s narration, slowly but surely. Green, a girl born and raised at Foxlowe and who knows nothing else/fears anything outside, tells us of life at Foxlowe, and introduces us to the rest of her “family”. 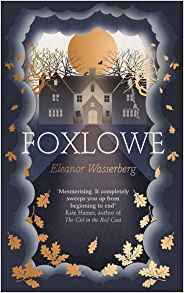 She’s an unreliable narrator, as her life in Foxlowe (re: abuse, brainwashing, etc) has not only numbed her to the realities of her situation, but given her comfort. Her scars soothe her, remind her of how things are, and “All The Ways Home Is Better”. She begins her story at the arrival of Blue, a baby brought in by Freya, the leader of their group. Green is jealous of the attention Blue receives from Freya, and decides to do the worst thing imaginable to her limited worldview: take Blue out in the middle of the night and place her beyond the “Scattering”. For the members of Foxlowe believe in purifying the ground with salt, and circling their home with it during Solstice to keep the Bad out. After Green does this, she’s wracked with guilt, believing the Bad has taken over Blue completely. As the years go by and Blue speaks of her unhappiness with their life, Green can’t help but wonder if there’s something sinister behind those statements. Their fellow “ungrown” and Green’s best friend, a teenage boy named Toby, is torn; he’s not particularly happy at Foxlowe, but he’s not willing to leave it either. When adult, “grown” members leave their community (becoming “Leavers”), the delicate balance of power among the adults is thrown off balance, leaving only Freya in charge. And what a leader she is. Freya – a bitter, savage, manipulative, yet captivating villain in true Gothic style. It’s Freya who truly fears the Bad, and who has had the harshest dealings with it. Wasserberg drops hints throughout the book that Freya is depressive at best, and mentally unstable at worst. Freya is a fascinating character, with the mythology and social structure of the commune building up her fears, and easing them, in equal measure. Add to Freya’s instability a toxic polyamorous relationship, and it’s no wonder the other “grown” constantly try to curb her penchant for abusive behavior. Still, with all the trappings of Gothic horror, it never quite gets there. Halfway through, and there’s nothing but the faintest whispers of horror. Rather, it’s a feeling of unease, that something could throw things out of whack with one breath. And at the book’s climax, the story has jumped around in time and place so drastically that those thin webbings of dread turn into a nagging thought of “just tell us what happened, already”. When it’s told, after such a buildup, it’s heartbreaking, but it didn’t pack the punch I expected. Yes, the abuse, punishment and berating of the “ungrown” is horrific, yet as Green tells it – in her matter-of-fact way – I became numb to it as well. Foxlowe takes your mind and plays with it much the same way the Family do each other. A sly, stealthy feeling of dread you can’t quite put your finger on, and little by little, their life feels understandable. Backwards, even dangerous at times, but I could understand how they got there… Which might be the scariest thing of all. This entry was posted in Books, Green Man Review. Bookmark the permalink.